Have you ever had problems equalizing on a dive? Maybe your ears hurt underwater when you descend? If you’re unlucky, maybe you know the feeling all too well. If you’re extremely lucky however, maybe you haven’t experienced this yet. If there’s one thing that’s certain in diving, it’s that sooner or later you’ll have a dive where the dreaded ear equalization problems will creep up. That’s where this guide will come in handy. In my sixteen years as an instructor, I have seen all kinds of students who have had difficulty with equalization. Hell, even I had some problems with this skill when I first started. After all, it is not natural for us to “pop” our ears. The good news is that the vast majority of the time SCUBA diving ear problems are easily correctable. Things like being able to equalize one ear easily but not the other, being afraid to push too hard and having sinus congestion are just a few examples of the things that happen which you can easily overcome. Below we will explain how to stop your ears from hurting underwater so you can dive comfortably for years to come. Why do my ears hurt underwater? Before we get started, let’s talk about what causes the pain we feel when we descend. It all has to do with pressure. As we descend into the water column the pressure surrounding us increases. That increase causes our ear drums to compress. This happens because the water pressure outside of our ear is greater than the air pressure inside of our ear. Equalization is the process whereby we equalize the air pressure in our inner ear to the pressure outside of our ear. We do this by pushing air from our sinuses to our inner ear through the Eustachian Tube, a thin tube that connects our inner ear to our sinuses. Because the Eustachian Tube is so thin, it is easily compressed. Once compressed, it becomes extremely difficult to pass air through the tube. This makes it almost impossible to equalize and is the reason why we must equalize early and often when we begin our descent into the depths. What happens if you do not equalize? Have you ever wondered what would happen if you did not equalize or were unable to equalize? Well, there are a couple of things that can occur and they are not pleasant. First, you could theoretically cause your eardrums to burst if you were able to stand the pain caused by not equalizing and were able to descend deep enough into the water column. This is unlikely since the pain alone would likely cause you to stop your descent. What could happen is that, once you feel pain in your ears, you would try too hard to equalize by pushing air too forcefully. This can cause too much air to go into your ears and possibly rupture your eardrum. Not very pleasant! The first is, you do not equalize early and often. This causes the Eustachian Tube to close which forces you to push air harder through your sinuses. Forcing the air in this manner could cause your eardrums to burst. This is why you should stop descending immediately when you feel pain in your ears. Forcing air into your ears on descent when you feel pain can cause your eardrums to burst. Secondly, you dive while congested. The congestion causes the air to not pass through the Eustachian Tube properly. Upon ascent, the air in your inner ear cannot escape which, if not handled correctly, could cause your eardrum to burst. This is called a reverse block. I would like to note that, in the event that you feel pain in your ears on ascent, you MUST NOT attempt to equalize. In this case, you need to slow your ascent to a crawl so that the air can slowly escape. The last thing you want is to have an ear drum pop. Get Your FREE Guide. Learn The Secrets Of The Pro's. 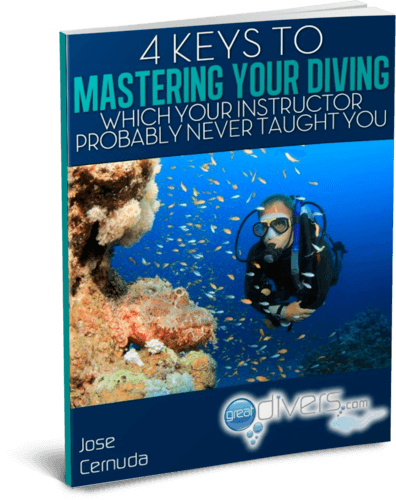 Discover The 4 Little-Known Keys To Being A Competent, Comfortable And Skilled Diver. When to equalize when SCUBA diving? A good rule thumb here is to understand that, if you feel pain in your ears, you have waited too long to equalize. In the event that your feel pressure in your ears, stop your descent and ascend a few feet until the pain goes away and you can equalize. Once this happens, you are free to continue to descend to that wreck you are dying to see! You should never equalize on ascent. The air in your ear needs to escape as the surrounding pressure decreases. Because of this, there is no need to add more air to your inner ear on ascent. Remember that, due to your dive site’s topography, your actual depth may change while you are diving. Whenever you ascend a little to see that shark swimming at the top of the reef, you have to equalize again to check out the eel in the hole at the bottom! There are several different ear equalization techniques you can use for ear preasure relief. Which one is best for you truly depends on your physiology, how your sinuses are functioning on the day you are equalizing and simple preference. The good news is that there is something for everyone here. In my experience as an instructor for several years, I can tell you that I have never had a student who I was not able to teach how to equalize. While there are rare cases where people cannot equalize due to physiological problems, the vast majority of people are able to do so once properly trained. The most common method of equalization is called the Valsalva maneuver. This is probably the one that you were taught in your dive class. The Valsalva maneuver is named after Italian anatomist Antonio Maria Valsalva, who was the first to document the technique. You perform the Valsalva Maneuver by pinching your nose and gently pushing air to the back of your throat through the Eustachian tubes and into your inner ear. Here’s the thing, in order for you to complete this correctly you should be able to physically see a bulge forming on either side of your nose if you look down. Think of it as blowing up a balloon. A good way to practice this is to equalize in front of a mirror while watching your nose. You should be able to see the skin on your nose expand. It is important to remember that, while you do not want to blow too forcefully, you do need to apply enough force to feel your ears filling with air. Go ahead and try it now. If the Valsalva maneuver does not work, do not worry! There are several ear equalization techniques you can try. A combination of the above can help as well. The Frenzel Maneuver is another alternative to the Valsalva maneuver. It is performed by pinching your nose while pressing your tongue against the back of your throat while making a “T” or “D” sound. What you are doing with the vast majority of the variations above is relieving pressure on the Eustachian tubes to allow the air to enter them so you could equalize. What if I still Can't Equalize Ear Pressure?? Believe it or not, despite all the variations you saw above, there is still a very small percentage of people who have difficulty equalizing. If you are one of these people, keep reading for some other tips to help you get to that dive site you’ve always wanted to see! Descending feet first: If you have trouble equalizing, try descending feet-first rather than doing a head-first descent. This reduces the change in surrounding pressure drastically. Remember that the greatest pressure change occurs in the first 33 feet (10 meters) of water. By starting your descent feet-first, you reduce the dramatic nature of the pressure change increasing your chances of equalizing. Descending on a line: If you’re still having difficulty equalizing, you can control your descent even further by descending feet-first on a line. The trick is to go slowly and equalize early and often. Chewing gum: Chewing gum before your dive relaxes your soft palate which has been known to assist in equalization. That being said, DO NOT chew gum during your dive! Besides the fact that chewing gum with a mouthpiece on is difficult. When you dive you’re breathing through your mouth which could cause you to choke on your gum. This could cause a potentially dangerous situation, so do not do it! When you are congested or have a cold, it is not recommended that you dive. Congestion can make it extremely difficult to impossible to equalize. Also, as mentioned above,diving while congested could cause a reverse block, that’s where the air in your inner ear cannot escape and could potentially cause your eardrum to burst. Some people have advocated taking medication to relieve congestion before a dive. This is potentially dangerous as the side effects of medications while under pressure are not completely understood and their effects could wear off mid-dive causing a dangerous situation. The big takeaway here is that, when done properly, equalization is not difficult and it is safe. Just like anything else we try to do, it requires practice to master. Whichever method you decide on using, just remember that you will get better at it as you continue to dive. Equalize right before you begin your descent and continually all the way down to your dive site. Remember that we never equalize on ascent. If you feel pain in your ears on descent, stop and ascend until the pain is relieved before attempting to equalize. If you have difficulty equalizing remember that it is easier to equalize when you descend feet-first. Do not dive when you are congested. Practice several methods of equalization, just because one doesn’t work does not mean a different one won’t. Finally, remember that practice makes perfect. If you would like to learn more about the valsalva maneuver along with the other equalization techniques mentioned in this article. Make sure to watch this video from Dr. Edmond Kay on how to resolve common SCUBA diving ear problems.